Nothing says “you are now in the tropics” quite like bamboo-bladed ceiling fans. Unless it is geckos on the walls. My ceiling fans aren’t bamboo but I do have the geckos. I have at least two geckos. I can tell them apart because Number One is bigger than Number Two. This is my Gecko number one. He was sitting on the screen of one the bedroom windows catching some morning rays. 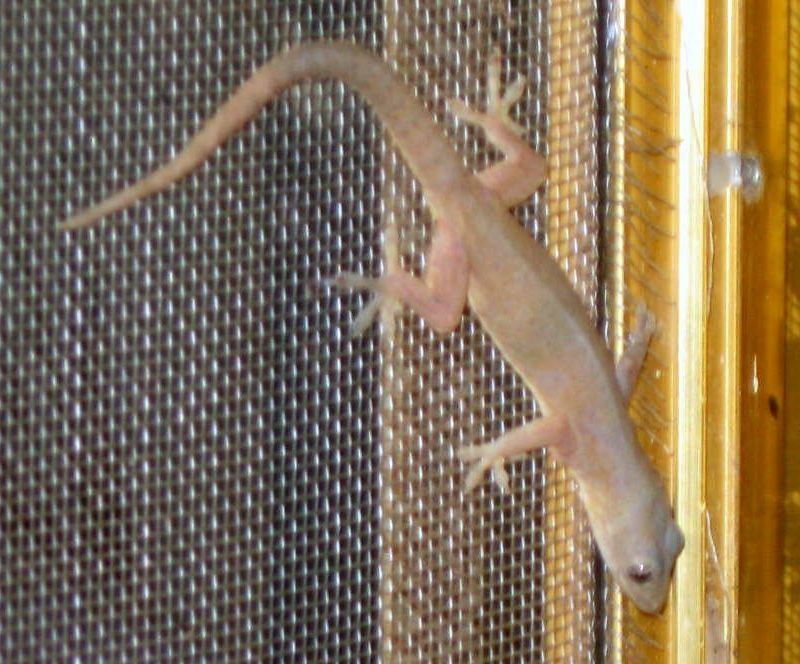 Geckos are harmless little lizards, but in the tropics, they serve a vital household chore. They kill and eat other insects. including cockroaches, mosquitoes and termites. Geckos have the ability to camouflage themselves. They can change body color to blend with their background. If you see one, don’t try to grab it. If you happen to touch their tail, it will instantly break off. This little trait helps them escape from their predators. Of course, they do have the remarkable ability to regrow a lost tail. Another remarkable ability of the Gecko is to walk on glass or on ceilings. 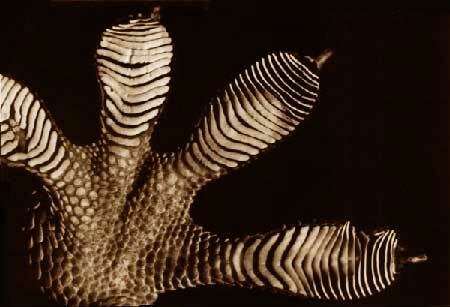 The picture above is a close up of the gecko’s foot showing how they accomplish a feat that Spiderman would envy. Hannah just got a pet gecko named Ella. Poor little thing. 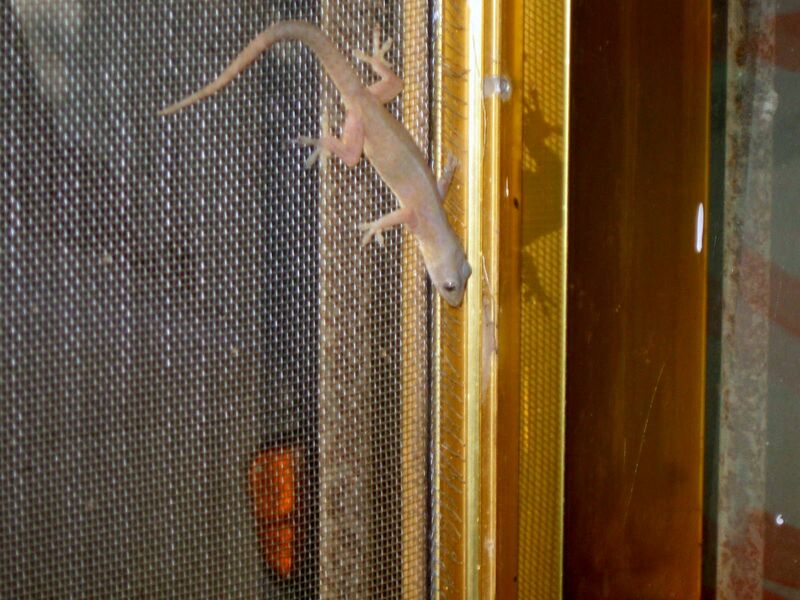 we have a similar little fella at the house here Ed, not a Gecco but some sort of a skink and would you believe???? Sis spotted one de udder day wif too tayles!!! I figure that seeing as they ditch the tail at the drop of a hat (just like your Gecco) this lil fella has decided to “Stock up” and grow a pair of tails simultaneously….Nature is unpredictable!!! I guess two tails are better than one if you are a lizard trying to get away from a cat or something like that. At the least, it would confuse a predator.